Laceno in Italy (in the Appennini region) is a small ski resort with just 5 ski lifts ( 2 chair lifts, 3 surface lifts) but it does boast a very impressive 600 metres (1968 feet) of vertical descent. Laceno has 13 pistes. 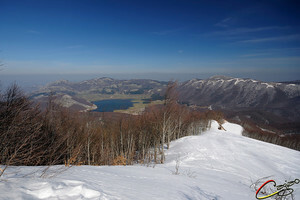 Laceno is best suited to intermediate skiers and snowboarders but there is some terrain for beginners and advanced skiers. Cross country ski trails can be found Laceno. The nearest airport is at Naples and the nearest train station to Laceno is at Rocchetta-Sant'Antonio. We visited Lagolaceno for few times in the winter between 2003 and 2007 and it's been wonderful. We stayed in hotel El Grisone, which had a classy restaurant, spacious rooms and convenient entertainment. We are planning to visit again this year. We hope the place lives up to the standards of the last experiences. Provided there is enough snow, don't waste your money on posh resorts. The place is original!